Many of the Syrian refugee children coming to Germany are traumatized by what they have experienced in the war-torn country. Kurdish artist Hassan Deveci has opened his Cologne studio to help them deal with their trauma. 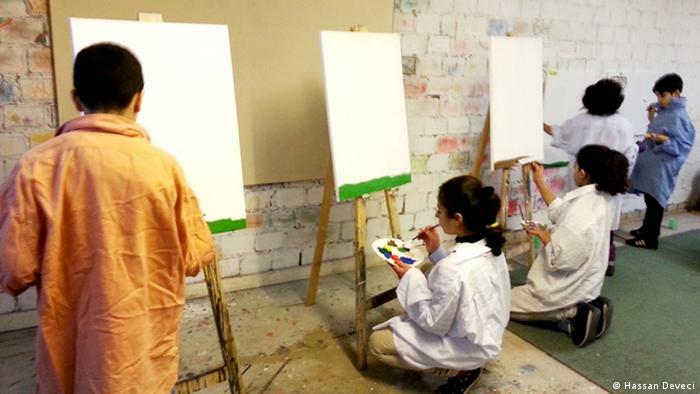 Bombings, destroyed houses, camouflaged helicopters – many of the refugee children’s paintings shown in a Cologne studio depict those scenes because that’s what the kids remember all too well from living in, or fleeing from, war-torn Syria. Thirteen-year-old Avjin pointed to her painting of a girl lying on a surgical table. “Her heart is bleeding, she doesn’t feel well,” she said. Deveci, 43, said he can understand the uncertainty that comes from being a refugee in a foreign land. He fled Turkey in the mid-90s because of political oppression of the Kurdish minority there. He applied for asylum in Cologne in 1994 and had to wait more than three years later, after staying at a makeshift camp, a hotel and a shared flat with two other refugees, until he was ultimately granted asylum. His memories of those years are grim. The kids have undergone quite a transformation over the past year, Deveci said. “At the start, two kids hat real problems with concentration and the German language, but this changed after six months. They became much more open and self-confident,” he said. Such private initiatives, however, cannot be sustained forever, Deveci added. He had to reduce the number of days children can come into the studio from weekly to once or twice a month because he ran out of material and money. He said he is just one of many people doing volunteer-work for refugees in Cologne.